Use these free Santa clipart images to decorate letters from Santa, your family's Christmas letter, business newsletters, or any other printable or online Christmas project you're working on. You'll find all types of Santas in this Santa clip art up to all sorts of Christmas activities. Whether you're looking for a silly and contemporary Santa or a vintage piece of Santa clip art, you should find just what you're looking for in this list. Tip: All of the Santa clip art below is free for you to use for personal projects but you'll need to check each image's terms if you want to use the picture commercially. You can find even more free Christmas clip art including Christmas tree clip art and Christmas borders. There are also tons of other Christmas freebies available like ​printable gift tags, and Christmas tree templates. This vintage Christmas postcard features a Santa clip art image of him coming to town with a bag full of presents on his back. WP Clipart has more Santa clipart images with Santa laughing, driving his sleigh, decorating for Christmas, delivering presents, and more. Click on the Santa clipart image you'd like to use and then use the buttons to quickly download, edit, or print the image. Santa is on his sleigh and ready to deliver gifts in this colorful Santa clipart image. 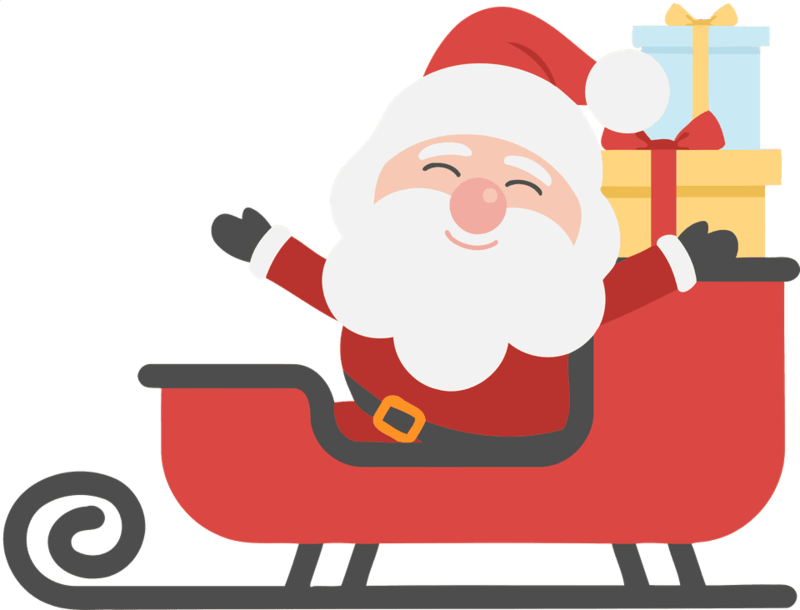 There are dozens of other free Santa clipart images of Santa delivering gifts, getting on his sleigh, sliding down the chimney, or just being his ol' jolly self. This is a vintage clip art image of Santa with jolly red cheeks, a snowy white beard, and a bright red hat that jingles everywhere he goes. There are a few other images of Santa here and you'll fall in love with every single one of these vintage pictures. Click on the thumbnail to view the largest image and then save it to your computer. Santa has got a big smile on his face in this classic image of the Santa that everyone remembers from their childhood. To download, click on the image and then the button that says "Click here to save this clipart." You can then right-click to save the image. There are almost 100 more free Santa clipart images here that will bring a smile to your face. This fun Santa clip art image has the jolly guy holding a banner that says "Merry Christmas." There are a lot of other contemporary Santa clipart images here of Santa checking his list, talking to children, delivering presents, driving his sleigh, and even using the computer. Santa has his sleigh loaded with presents and is taking flight with the help of his reindeer in this Santa clipart image. There are five galleries of Santa clip art here that is really a great collection of Santa clip art with lots of high-quality images that are ready to be downloaded and used in your holiday project today. Santa is excited for Christmas in this clip art image that has him dancing and waving. There are a lot of great clipart images of Santa here that you'll fall in love with. In fact, you'll find 6 pages full. Santa is getting ready to sneak down the chimney in this modern meets retro Santa clipart image. There are two more pages of Santa Claus clip art that has Santa dancing, winking, making toys, relaxing, and looking just downright jolly. 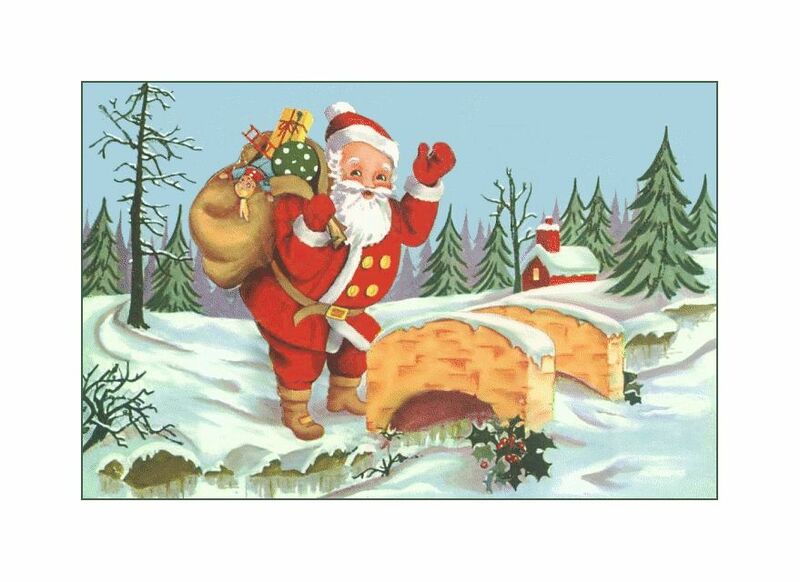 Just use your mouse to save these Santa Claus clip art images right to your computer.